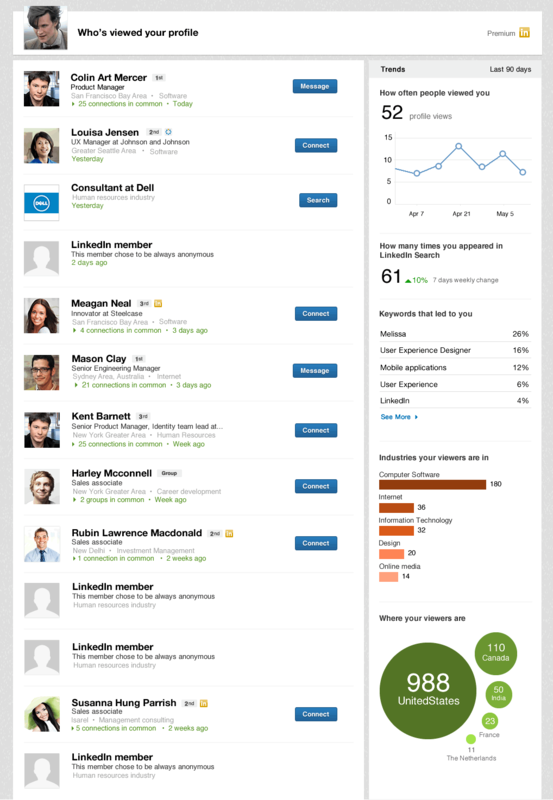 LinkedIn is rolling out a new, simplified look for the section of its social network which gives users a comprehensive list of the people who have recently viewed their profile. The layout for users with a ‘free’ account is largely the same, showing a mixture of known colleagues and contacts alongside a smattering of ambiguous people who reside outside of their existing network. It has been bolstered somewhat, however, with a new trends section which pops up on the right-hand side of the screen to display a line chart of users’ viewing figures. This section is greatly expanded for Premium members, however, listing the most commonly used keywords when searching, an analysis of the industries that viewers are qualified in, their current location and more. It should be a valuable asset for job seekers and those looking to see where their skills are needed or most highly sought after. Premium users will also be able to filter these search results by a specific week, rather than the last 90 days, making it simpler to identify underlying trends. 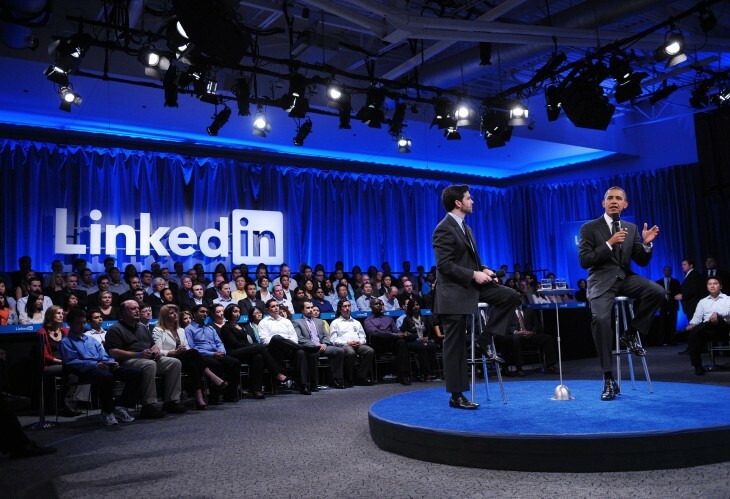 LinkedIn say it’ll be rolling out the revamped section “around the world” throughout the day. 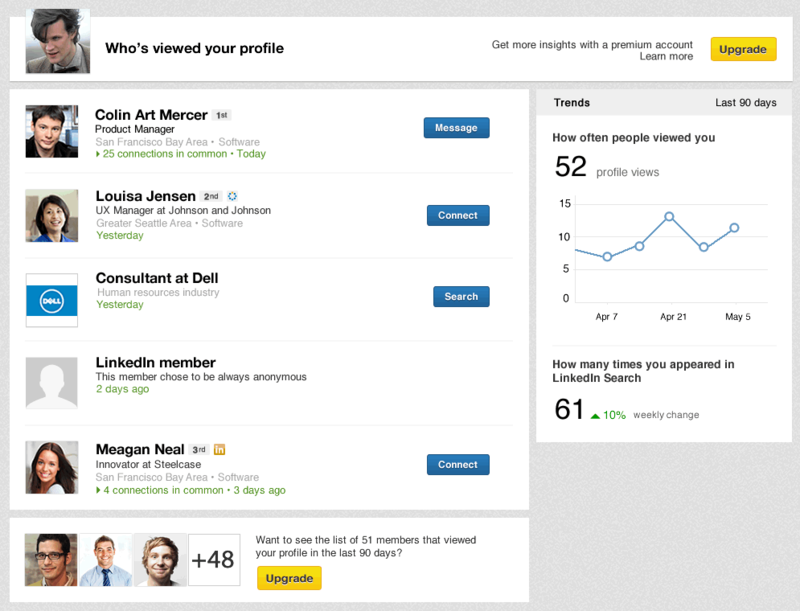 “Please stay tuned as we look to bring you deeper, more actionable data-rich insights from Who’s Viewed Your Profile,” Udi Milo, product manager at LinkedIn said. The redesign follows the introduction of optional two-step verification via SMS, announced last week, as well as the ability to share rich media content, such as photographs, documents and presentations, within status updates on the home screen. The enterprise-focused social network will soon face competition, however, from the Wall Street Journal as it looks to launch its own offering, WSJ Profile, over the next fortnight.